The elegant Providence glass insert features sophisticated textures, subtle bevels and a grey glass border. With an obscurity rating of 7 (9 being the most obscure) you will enjoy natural light in your home while still maintaining some degree of privacy. This insert is designed to fit into a standard 1/2 Lite opening in your door. It includes the fastening hardware and a pre-caulked white frame that will not fade or yellow. Create your own custom-look entryway with a new steel cut-out entry door by Masonite<sup></sup>. Manufactured to accept a standard 22" x 36" glass insert, allowing you to upgrade your door and re-use your existing glass or choose from our easy-to-install in-stock or special order glass styles and create the custom door you want. Our high-quality steel entry door is sure to suit your design and performance requirements. The high-definition panel profile provides excellent shadow lines, creating outstanding panel definition. This unit also comes with a durable pre-finished white vinyl cladded frame. For added value this door is insulated with a polyurethane core, providing an energy efficient entry system recognized by ENERGY STAR. This unit comes double bored making it ready to accept a lock set and deadbolt and has been factory primed, ready to install. Masonite's Venting Low-E glass insert combines energy efficient Clear Glass with an easy-open lower Sash. Its virtually maintenance-free and will not yellow or crack. Our high-quality steel entry door is sure to suit your design and performance requirements. The high-definition panel profile provides excellent shadow lines, creating outstanding panel definition. For added value this door is insulated with a polyurethane core, providing an energy efficient entry system recognized by ENERGY STAR. This unit comes double bored making it ready to accept a lock set and deadbolt and has been factory primed, ready to install. Masonites Venting Low-E glass insert combines energy efficient Clear Glass with an easy-open lower Sash. Its virtually maintenance-free and will not yellow or crack. Our high-quality steel entry door is sure to suit your design and performance requirements. The high-definition panel profile provides excellent shadow lines, creating outstanding panel definition. For added value this door is insulated with a polyurethane core, providing an energy efficient entry system recognized by ENERGY STAR . This unit comes double bored making it ready to accept a lock set and deadbolt and has been factory primed, ready to install. Vinyl cladding has been added to door jambs for additional protection from the elements. Providence 22-inch x 36-inch Nickel Glass Insert The elegant Providence glass insert features sophisticated textures, subtle bevels and a grey glass border. With an obscurity rating of 7 (9 being the most obscure) you will enjoy natural light in your home while still maintaining some degree of privacy. This insert is designed to fit into a standard 1/2 Lite opening in your door. It includes the fastening hardware and a pre-caulked white frame that will not fade or yellow. 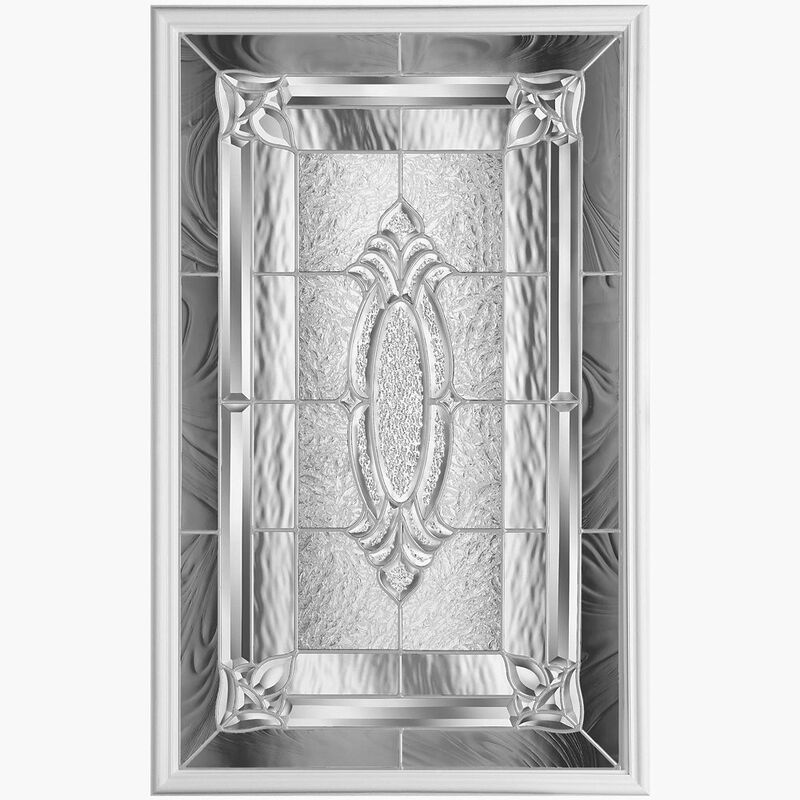 Providence 22-inch x 36-inch Nickel Glass Insert is rated 5.0 out of 5 by 1. Rated 5 out of 5 by HHTC from Looks amazing and great quality! Bought this at my local homedepot and installed as a Saturday night project. I've got to say that this insert looks even better once installed (than in store) and is of excellent quality. For those thinking of buying this, note that it already comes pre-CAULKED so no need for any additional caulking (just take a careful look at product and you'll see what im talking about. Although a super simple diy project i had a hard time separating my existing half-lite from my door due to the super sticky adhesive (use care so as not to dent youre door during the removal process). Last word of advice, don't overtighten the screws.